In early 2011, Al Garver, Executive Director of the Enlisted Association of the National Guard contacted Jess Melot of The Rifle Shoppe in Jones, Oklahoma, understanding that EANGUS was as serious about detail and quality as he was Jess agreed to go to the Smithsonian and inspect the musket. In July, Jess Melot met with Al Garver of EANGUS and David Miller the Associate Curator of the Smithsonian's Armed Forces History Division to measure, photograph, and make impressions of the weapon. During the inspection of the musket, Jess was impressed that the musket was not the typical matchlock of the period, but something uniquely American made and incredibly, could be the first American made weapon surviving. The branding on the stock is "Newtowne" which was an outpost of the Massachusetts Bay Colony built in 1631. In that colony every male 16 and above was required to own a musket and if they could not afford one they could buy one from the colony itself and pay it out in work or crops. In 1636 the name of the town was changed to Cambridge. With this information, this put this musket as being built sometime between 1631 and 1636, WOW! Studying the construction techniques and stock design it was obvious that the musket was built in America, by the first Americans and used in some of the first muster's by the American civilian soldiers. Jess returned back to his shop so impressed by the musket, he built the prototype, which was sent back to Al Garver to compare. They were impressed with the attention that applied to detail and The Rifle Shoppe was awarded the contract to produce them for the Enlisted Association of the National Guard. Net proceeds of this project go to benefit EANGUS and its We Care for America Foundation, which provides emergency financial grants to soldiers and airmen of the National Guard who have experienced a catastrophic loss. EANGUS is limiting production to 375 Weapons, in conjunction with the National Guard's 375th Birthday Celebrations. To Date, Actual and pending orders total 81 units. Contact Melissa Cross to place an order at (703) 519-3846 Ext #25. Click an image to display larger image and description. The original, a .75 caliber (3/4-inch musket ball) matchlock musket. Due to the unique stock styling and construction techniques shows it was manufactured in America. Click the picture for more info. 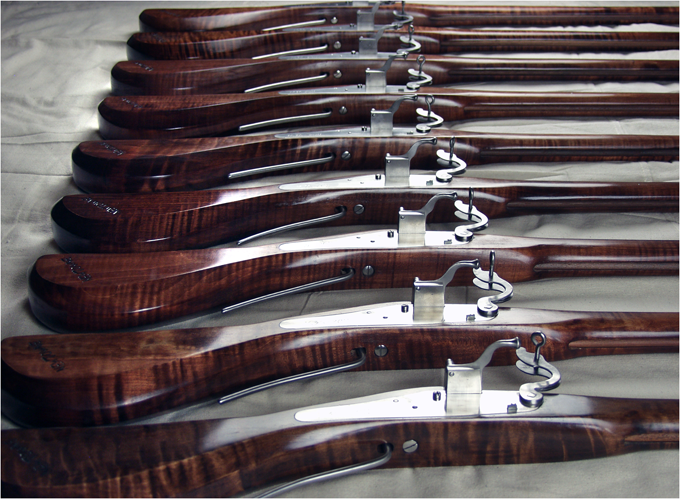 The replica is being manufactured by The Rifle Shoppe in Jones, Oklahoma. Which is known for historically correct reproductions with attention to even the smallest details. The painting of The First Muster above shows Musketeers using Musket Rests as well as the Powder & Ammo Bandolier, these items are shown and offered on the Accessories page.